Dining at the 60 or so kiosks in Luquillo might be considered a rite of passage for the true Puerto Rico traveler. Most people end up falling in love with the fare at a favorite numbered stall, which might serve anything from down-home Puerto Rican basics to gourmet burgers to ceviche and other international dishes. Don't be discouraged by the rustic exterior; inside you'll find a casual, welcoming ambiance and a meal worth sending a postcard home about. From gourmet Italian to fried snacks, everyone can find something they like here. Those on a budget find cheap eats aplenty at numerous kiosks. After the main dinner hour, a fun late-night scene develops. The location is accessible only by car. On the outside, the place admittedly looks a bit grungy. The kiosks are located on the north side of Route 3, near Luquillo Beach and just past the Route 191 entrance to El Yunque. Hours and days vary, but from 11 a.m. to 10 p.m. on most days, you'll usually find at least a few kiosks open. From the outside, the long string of dilapidated sheet-metal stalls housing the revered kioskos de Luquillo may be a bit disconcerting. But step inside anyway and start sampling all kinds of frituras, crab on a stick, and other goodies. El Jefe Burger Shack (Kiosk #12) has ridiculously delicious stuffed burgers that have made it among the most popular hangouts at the kiosks. A Peruvian couple owns Ceviche Hut (Kiosk #38), which gives it instant credibility; so does the signature ceviche dish, which uses red snapper as the main fish. If you don't want seafood, there's plenty more to the menu. La Parrilla, which means "the grill," has long been the fine-dining option among the kiosks. Located at Kiosk #2, it's also one of the pricier menus. But the food is very good, a mix of classic Puerto Rican with some Caribbean fusion thrown in, and it is known for its gourmet seafood (try the stuffed baby red snapper). Osso Buco (Kiosk #29) offers surprisingly good, and surprisingly authentic, Italian fare. The eatery certainly ranks among the more refined options at the kiosks. Congas by the Sea (Kiosk #9) serves tasty food at decent prices. 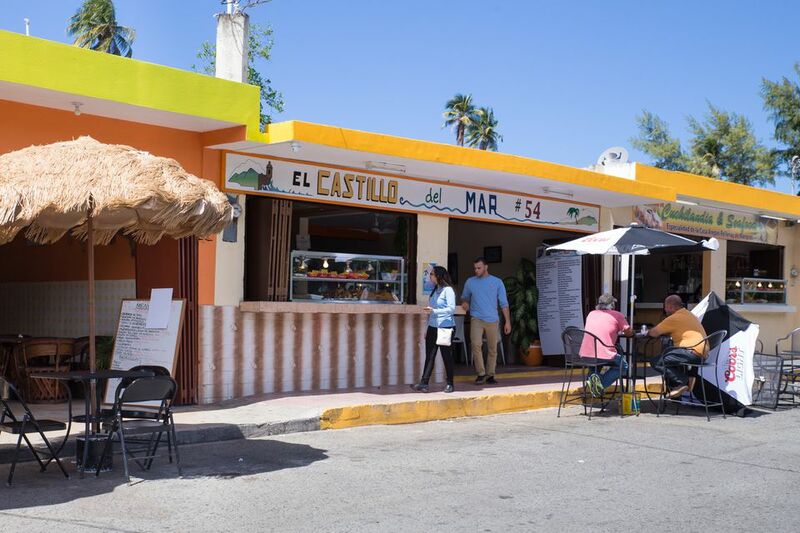 Roca Taino (Kiosk #60) is the last on the kiosk row, and a great place for typical Puerto Rican bites such as tacos (not to be confused with Mexican tacos: the Puerto Rican version is a large, deep-fried, cigar-shaped flour tortilla stuffed with beef, chicken, crab, shrimp, or lobster. ).